Veterans and Wounded Warrior Adventures! Over the past couple weeks; I have had the opportunity to go on a couple trips with Don to the Black River located in Bladen County, NC. This river offers plenty of beautiful wildlife including wild turkey, deer, several types of ducks, and wildflowers. The Black River is also home to the Three Sisters Swamp where you can find some of the oldest recorded cypress trees in the country. Although these trees are not marked, for their own protection, with an experienced guide such as Don, you will be able to see some amazing old growth cypress trees in this swamp that have been dated to being over 2,000 years old. Paddling through this swamp truly is a majestic experience. Being able to get up close and personal with these ancient cypress trees gave me a deeper connection to this swamp. In ways this swamp inspired me by showing me no matter how hard these trees have been hit and beaten by countless hurricanes, high winds, floods, and other natural disasters, they still stand tall and strong after all those years. One of the most memorable parts of both these trips included seeing the beautiful spider lilies bloom. This is a special phenomenon here in eastern North Carolina because these plants only bloom for about two weeks out of the year. But what a spectacular experience it is to be able to see these plants bloom during their short flowering period. It’s trips like these which make me realize how lucky we are to be able to experience gods creation and enjoy the natural beauty of many diverse eco systems from a kayak. Don & Diane Harty own Mahanaim Adventures. They specialize in helping families and groups to have “Positive & Memorable” outdoor adventures. Whether these are wildlife view adventure, camping adventure or a simple kayaking adventure. 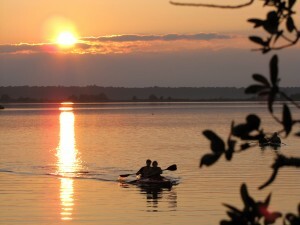 They provide kayaking adventures on Town Creek, Cape Fear River, Fort Fisher Basin, Masonboro Island, Black River, Holly Shelter Creek and Moores Creek. Contact them at www.mahanaimadventures.com for more information about all of their adventures. This blog was written by Mike Manning. I am Mahanaim Adventures new intern for the summer of 2018. I am a Park and Recreation Management student at East Carolina University, Go Pirates! I love the outdoors and have a strong passion for kayaking. This coming summer I will be writing a blog similar to this every other week to let everyone know about the awesome adventures we will have on the water this summer. Abundance. Webster’s dictionary give us the following description as “an ample quantity; an abundant amount; profusion; affluence, wealth; a relative degree of plentyfulness.” Recently I have begun thinking about what abundance really means in a person’s life. I have come to think that we, at least in the United States may have the wrong idea of what abundance means. You see, I have grown up with the idea that an abundant life was one that had wealth and things that made life easy. But over the past 8 years, my thinking has begun to shift about this definition. You see, I consider myself a normal, common man that works very hard to provide for my wife and kids. I worked hard and often long hours to have what I thought was “an abundant” life. But chasing after all the abundance that our society says we should have, and to be a “Successful Provider” for my family, left me tired and empty. It seemed that the abundance that I wanted; was always just one step ahead of where I was at and I needed to do more. You know, work harder to move up the corporate ladder and get that next promotion or big pay raise. Please don’t get me wrong, I do believe hard work is essential to success anywhere you go. Yet my hard work never brought me what I thought it should; the abundance I always hoped for. Recently my perspective on abundance has shifted and I found that I already had all the abundance that I had been looking for. You see, the abundance that I was seeking was found in the relationships that I was developing with my wife, with my kids, with the people God had placed around me. It was not in the affluence or wealth of having many things or providing my family with all the worldly things that they desired. The abundance I was needed the most was in the relationships that I have been developing. Back in 2010, I was laid off from a wonderful job at UNCW (great place to work). At that time, my Bride and I started Mahanaim Adventures. Through the past 8 years, I have had the awesome opportunity to work side by side with each of my kids, leading kayaking adventure all over the Cape Fear area of Coastal North Carolina. Now my kids are grown and all on their own, but I have all of these awesome moments spent with them, not just working and having fun, but making memories together. Today, Joseph and I run the adventures together and I am blessed having him with me in this. And my two daughters, well, they want to take part when they come into town from where they live with their families. So you see, because of a simple little change in my perspective, my whole outlook on what I have or don’t have has changed. Yes, I still work hard to build our family business and I still can work some long hours. Most of my weekends are shot, because I am working, especially during the warmer months. But I now see my life a much fuller and richer; and has replaced the chase after things of abundance with a real abundance I was craving. All of this because of a change in my perspective; or could I say “Attitude”. Don and Diane Harty are the owners of Mahanaim Adventures; the Cape Fear and Wilmington, NC areas premier outdoor adventure guide and kayaking business. Don and Joseph (son of Don and Diane) strive that each person on our adventures to have a “Positive & Memorable” experience. We offer quality half-day, full-day and overnight kayaking adventures. We also provide team building adventures and courses as well as wilderness first aid classes to Boy Scouts and other groups. Posted in Adventure, backpacking, Family Camping, Kayaking, Uncategorized | Comments Off on Abundance? I recently had the pleasure of taking a family of three from West Virginia on a Sharks Tooth Island adventure to hunt for prehistoric sharks teeth and fossilized shells. This trip was different than others in that I was given to opportunity to experience a family’s first time in kayaks. They were gung-ho from the get-go, ready to learn and create memories. Once on the water I immediately heard the father laughing in excitement. I recall him saying, “this is the coolest thing”. This family was no green horn when it came to hunting for shark’s teeth. They had been coming to Carolina Beach every summer for the past 20 years. Upon landing at Shark Tooth Island we began finding teeth straightaway. That morning we had a really low tide creating opportunity for great hunting. With the tide so low we were given the chance to hit all three islands, our final stop being Keg Island. Not five minutes after landing the father found one of the largest sharks teeth I’ve seen found. The tooth was of a Great White Shark. It had a full shank around 3 inches wide and was around 2 inches long with the tip broken. We couldn’t believe our eyes. That morning might have been the most successful hunt I’ve ever had with a group. This trip proved that the teeth are out there, we just have to go find them. This Blog was Written by Sam Law. I am Mahanaim Advenures new intern for the summer of 2016. I am a Park and Recreation Management Student at East Carolina, Go Pirates! I love the the ocean and outdoors more than anything. This coming summer i will be writing a blog similar to this each week to let everyone know about the awesome adventures and encounters we have. I hope to see ya’ll out paddling this summer. We found ourselves in the parking lot of Patriot Hall at the Moore’s Creek Battlefield in Burgaw, North Carolina. Don and I were preparing to lead a group of folks from Brunswick Forest. That day we had the honor of guiding many repeat participants whom we had the pleasure of giving a kayak lesson to weeks prior. Our paddle that morning consisted of a four mile trek down and back up Moore’s Creek. During the trip our group paddled under the replica bridge in which the Battle of Moore’s Creek was focused around. Many Prothonotary Warblers were darting across the creek that morning. After our paddle that day we met with Jason Howell, a park ranger at the battlefield, who gave us a walking tour and lesson of the historic sight. The story goes that in 1773 after the Boston Tea Party, the “intolerable act” is put in place turning Massachusetts into a military state. This scared other states, enough to have other states aid Massachusetts. North Carolina residents send corn and supplies in order to help but were reprimanded by the North Carolina Governor. A frigid evening on February 26, 1776, General Donald MacDonald of the Loyalists alongside of Scottish Highlanders,set camp on the south side of the bridge. Colonel James Moore and his group of militia men and patriots prepare to the North. If the Loyalists are to take Moore’s Creek they will be able to take the North Carolina coast. Before the battle the Patriots remove the bridge tresses and oil the remaining wood in order to sabotage the Loyalists attempt to cross and attack. While the Loyalists attempt to cross the bridge the Patriots planned to attack. The battle happened accordingly to Colonel James Moore’s plan, gaining victory for the Patriots. Although the battle only lasted three minutes over 30 Loyalists men were lost while only one Patriot died. The Battle of Moore’s Creek was a huge step to North Carolina’s vote for independence. Moore’s Creek Battlefield is not only a beautiful paddle, but the area is full of rich history. Last Friday evening, I had the privilege of leading a group of people from Brunswick Forest on a moon light kayaking adventure on Town Creek. The evening was almost perfect; except for a few thin high clouds that tried to cover the moon. It was about 30 minutes before the sun set when we stopped for dinner on the river for a picnic and camp fire. We had been paddling for about 90 minutes and everyone was starting to get hungry. So while everyone was starting to enjoy their picnic dinners, I got a nice warm campfire started. In just a few minutes, the fire was blazing away, casting its glow around the area and creating a wonderful warm feeling for everyone there. It was almost instantly happened; once the fire was started everyone sat down on the bench or on one of the picnic blankets that were around the fire; when everyone stated sharing memories about their going up and campfires. It was so cool to sit back and watch everyone relax and enjoy the warm fire as the sun was setting to our west and share with each other. Stories about campfires they remembered as kids; the fun of roasting marshmallows and making s’mores. It seemed to me that all of these memories shared a common theme; family and fun. Someone shared that in her family, they would go to the family farm this all 6 of her brothers and sisters. As she talked about that, I could see the fun they had in her eyes and hear it in her voice. I shared about how my grandmother took candles and show me and a friend how to roast a marshmallow, while it was storming outside the house. For all I know the power could have been knocked out at the time, but I don’t remember that, I just remember how our little fire changed an evening into something fun. Soon, it was time for us to pack up, put out the fire and paddle back home by the full moon light that shown in the river. What an adventure the evening was for us all. I am sure that the paddle back to the kayak launch was memorable for each of them. But I am also confident that the time shared with new friends sitting around a campfire; roasting marshmallows and making s’mores will be a memory that these people hold onto. These people not only connected with something they remembered from their childhood, when things were simpler in their lives. But they also connected with each other, building important relationships. I don’t know about you, but I need this myself; what about you? 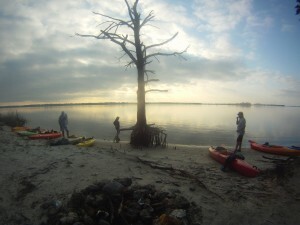 Mahanaim Adventures offers guided kayaking adventures in the Wilmington, Carolina Beach areas as well as the Cape Fear Region. We specialize in creating that memory of a life time for you and your family and friends. Check out our web page and find out more details about all of our adventure locations. Gloomy Days May Not Be So Bad? The past Saturday evening was one of those unexpected evenings. The day started out overcast and in some ways very gloomy. You know the type of mornings I am talking about; the ones where it just seems that it could just start drizzling and drizzle all day long. It seemed to be a perfect day to stay inside with a good book and read all day long. Yet for some folks, there is beauty to be found in the outdoors on a day like that. Besides, it was a welcome change to be out kayaking on a day that was very cool by comparison to most of the summer. I have often spoken about how much I like to take a hike or even to talk a walk in the rain. (I must admit, I get some strange looks, but that is OK.) It seems that the forest takes on a different feel when you are walking through it in the raining. When you do this often enough, you begin to see the forest in a different way. Then when the sun does decide to make its appearance, wow, words cannot describe the beauty of the forest at that moment. This past Saturday evening was like one of those days. That afternoon, Joseph and I meet a group of co-workers from a local business at River Road Park for a sunset kayaking adventure on the Cape Fear River. The day was still overcast and the hope for the skis to clear for a sunset was starting to look like it would not happen. Despite the fact that it was a cloudy and cool afternoon, these co-workers were excited about having some kayaking fun. We started out paddling along Keg Island, when I noticed that the weather was beginning to change. Joseph, spotted some rain to the southwest and northeast of us, yet there was a glimpse of some clearing to the west and northwest. I am not sure that our guests were even aware of this; they were having too much fun being out of the office and doing something fun together. Yet there it was a break in the clouds. After about an hour of paddling, we stopped on Keg Island for the picnic and before you know it, there was the sun! Shining brightly as only the sun can, reflecting off the almost mirror like water of the early evening. It is amazing how intense the sun can be reflecting off still water. But what a treat it was to be in such a beautiful place, just at the right time to witness a stunning sunset. As I was watching this sunset as we paddled back to the river launch, I was struck by the fact that we were the only people out kayaking that evening. Why was this? Maybe it was because of the overcast skies from earlier in the day? Maybe people did not want to risk, getting out and exploring something if the weather is not just perfect. If that is the case, they have missed a masterpiece of a sunset. I guess the point I am trying to make is this; don’t be afraid to step out and do something outdoors if the weather is not what you think it should be. You never know when things will change and you have a chance to be in the right place at the right time to witness something that few people ever do. If these co-works had let what they saw keep them from getting out that evening, they would have never had this experience of last Saturday’s sunset. Mahanaim Adventures offers guided kayaking adventures in the Wilmington, Wrightsville Beach, Carolina Beach areas as well as the Cape Fear Region (Cape Fear River, Town Creek, Holly Shelter Creek, Eagle Island, Black River, Lumber River, Moores Creek and much more). We specialize in creating that memory of a life time for you and your family and friends. Check out our web page and find out more details about all of our adventure locations. Why is it so hard to work as a Team?